Police in the state of Michigan have arrested a 19-year-old man in the fatal stabbing of his 17-year-old sister. The suspect was identified as Steven Kelsey and police say he stabbed his sister, Jesika Kelsey, multiple times to death at her home some time on New Year's Eve. Jesika’s lifeless body was found in a pool of her own blood by her mother, Jenny Spencer. Investigators say they have recovered a bloody steak knife as well as military id that had belonged to Steven in a dumpster outside a local restaurant. Neighbors say they are stunned suggesting that both Jesika and Steven seemed to have been close and early reports also suggest that Steven had been on military leave at the time of the crime and doesn't appear to have a criminal record. "what up loser i heart you lots!!! even if you may hate me from time to time :p o yeah love your pic goof ball!!lol!" 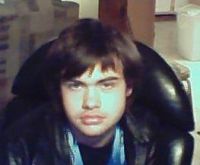 Besides the above MySpace profile from 2007, Steven also maintained a more recent one found here.